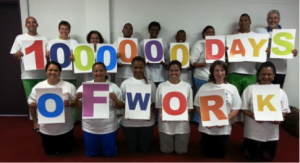 One Million Days of Work for the Unemployed! Every single day a person who has been interviewed and has registered with us goes out to work, we call it a workday. One day of work. One person. And then one more. Until we reach a million! That is how we can all make a difference to the future of this country. One small moment and then another. And in so doing, add a little more shine to the colours of our Rainbow Nation!